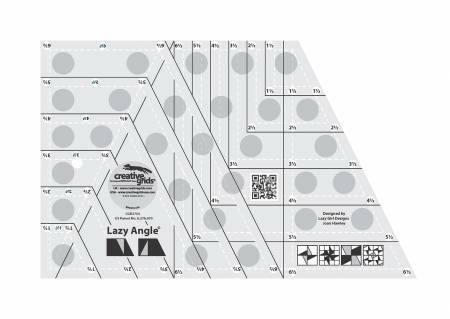 Make hundreds of Lazy Angle blocks in 1 to 6 inch finished sizes. Learn the simple technique of cutting and piecing A and B shapes to create a multitude of patterns. The ruler slides easily over the fabric until pressure is applied. Then, our exclusive gripper holds the fabric in place while cutting, eliminating slipping and miss-cuts! It comes with fully illustrated step by step instructions or scan the QR Code printed on the ruler to view a video demonstration. Creative Grids Rulers have a MAP (Minimum Advertised Pricing) Policy. Please do not advertise them for less than the suggested retail.